Ignatia Djanghara, Wandjina - the Rain Maker, courtesy Arts dAustralie Stephane Jacob, 2009. 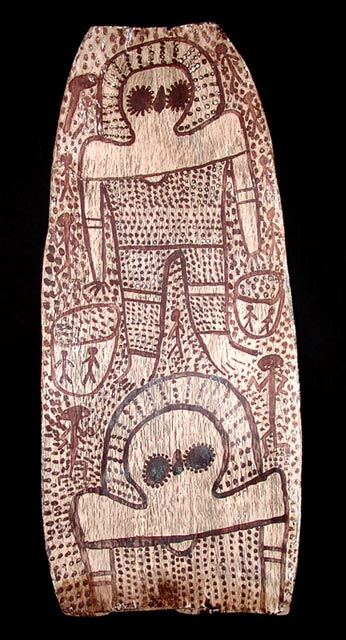 Wandjina paintings on bark were first produced for trade and exchange with missionaries travelling by lugger along the Kimberley coastline as early as the 1930’s. Unlike the Aborigines in Arnhem Land, the Worrorra, Ngarinyin and Woonambal custodians of the Kimberley had not previously used bark for painting, and as a consequence, the surfaces were often knotty and irregular, and the pigments were applied without fixatives. Few pre-1970s examples survive. Of those artists that gained recognition prior to the mid 1980’s, the most revered are Charlie Numbulmoore, who was first recorded painting by anthropologist Ian Crawford at Gibb River Station in the mid 1960’s and Alec Mingelmanganu, whose work was noticed by anthropologist Kim Ackerman during a visit to Kalumburu in 1974/75. In the early 1980’s Waringarri Aboriginal Arts was established in Kununurra and the first art coordinator, Joel Smoker, made regular visits to the former mission station at Kalumburru. Here, as in Balgo Hills and several other Kimberley communities, husbands and wives customarily painted together and supported each other making artefacts such as carved and decorated boab nuts, tools and weapons, ceremonial items and the first rudimentary paintings in ochre and resin on bark. Ignatia Djanghara and her husband Waigan worked together as did Rosie and Louis Karedada and Lilly and Jack Karadada. They gathered their ochres from the local creek beds and, like their counterparts in Arnhem Land used charcoal to create black paint. Little if anything is known about Ignatia’s childhood and youth. She first became prominent at Kalumburu in the mid 1980’s where she lived adjacent to the Benedictine mission that had been established in 1907, 25 kilometres from the northern coast. Both here and at Mowanjum (the site of a former Presbyterian mission), local authorities had exercised strong control over the Woonambal landowners who were taught that their tribal customs and beliefs were at odds with Christianity. Ignatia was born around 1930 and was already in her mid 50’s when she first began creating bark paintings related to the Wandjina. She and her husband were responsible for maintaining the remnants of these spirit ancestors which are said to have lain down in caves and turned into paintings on the cave walls after their time on the earth. The Wandjina are powerful fertility spirits. They are said to keep the spirits of unborn babies in the freshwater pools where women collect fish to eat when they want to become pregnant. They are traditionally characterised by large round black eyes fringed with short lashes. The centre of the chest features a solid black, red or simply outlined oval, which is believed to represent its spiritual essence. The almost circular head is surrounded by a halo or headdress representing hair, clouds and lightning. The inclusion of a mouth is rare. Its absence is most often attributed to a belief that painting a mouth on the Wandjina’s face would bring perpetual rain. Images of the Wandjina created on bark, canvas or slate were viewed by artists such as Ignatia as purely reproductions of the ‘real’ Wandjina’s adorning the cave walls at their most important Dreaming sites. Her primary artistic inspiration and purpose lay in her responsibility to maintain these ancestral beings, by repainting them and ‘keeping them strong’. The Wandjina image depicted above is typical of Ignatia’s work. Its shape is icon-like with rounded sides, narrower at the top than the base. Here two Wandjina are shown with bark buckets, unique to the Kimberley region. Gwion, or Bradshaw figures, accompany the Wandjina. Many observers, anthropologists, and historians believe that these highly sophisticated and stylized images were created by an entirely different group of people who may possibly have died out centuries before Europeans landed in Australia. These are seen throughout the region in adjacent rock art sites. Through the late 1980’s even the largest Wandjina paintings (up to 2 metres high) created by Ignatia, Waigan, Jack, Louis, Rosie and Lilly could be purchased for no more than $150 each. In 1992 the last remaining stock of the government marketing company Aboriginal Arts Australia was sold at a special Lawson’s auction and I personally purchased 5 large boxes containing more than 100 Wandjina paintings on bark for $300 per box. All were sold through Coo-ee Aboriginal Art Gallery for less than $20 each. Since that time they have increased in value 100 fold. They are now amongst the most highly contested items at auction. This is evidenced by the fact that 25 of 26 paintings by Charlie Numbulmoore; 12 of 16 by Alec Mingelmanganu; and no less than 47 of 49 by Ignatia Djanghara have sold at auction. While works by Numbulmoore have sold for as much as $228,000 and Minglemanganu for $244,500, Ignatia’s highest price to date is the $11,400 paid for a bark measuring 103 x 45 cm, at Sotheby's in 2005 (Lot 260). Though it is not known when Ignatia and Waigan passed away, these two wonderful old Woonambool elders left a priceless legacy. Wandjina images are amongst the most powerful of all Aboriginal art. They are certain to continue to grow in value as they are prized and loved by those fortunate enough to live with them.